It's fascinating to follow people's thought process as they digest the news of last night's Tsunami. 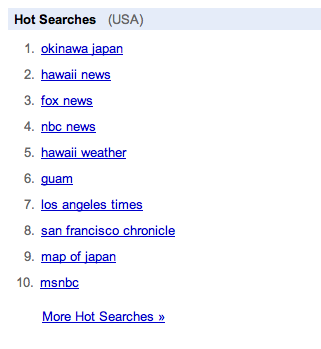 The searches flow West to East, with breaks to check their preferred news outlets. Given the reputations of Fox news' viewers, is it fair to deduce from this list that conservatives are not as cold-hearted as people make them out to be? Here they seem to out-number the NBC and MSNBC viewers, plus the readers of California's two biggest newspapers. Of course, another take suggests that more MSNBC viewers already know how to find MSNBC on their TV or computer than NBC or Fox viewers. Really, how dumb are Fox fans if they're Googling something that they could just type into their browser's address bar? In their defense, though, I remember once seeing a hot search that read "oprah.com/12days" so at least Fox fans have Oprah fans beat.